Planning and booking your destination wedding is a huge task, so to set yourself up for success with our 11 tasks before booking your destination wedding. Be smart about what you do first. Whether it’s going to be in the Caribbean, The Maldives, Greece, Thailand, Italy or Fiji, there is a lot of wedding stuff to plan. If you give yourself plenty of time and find the right support, you can have an amazing time and a wedding your friends and family will talk about for a long time! Your wedding is about the 2 of you, so it should be the 2 of you who decide exactly where and how your destination wedding is going to be. Why do you want to get married at a far away destination, what kind of backdrop do you want and how many of your friends and family are realistically going to come along? It helps to make a Pinterest board of themes that inspire you. This should help you to narrow down your choices and make booking your destination wedding smooth and simple. Your total budget sets the stage for the whole event. Make sure you know your budget limit and build in a fair bit of padding around it. Your wedding budget determines which venues you look at, how many people you invite and which vendors you hire. Also, find out the exchange rate which is especially important when booking your wedding venue, vendors or booking a locally based wedding planner. When booking your destination wedding, there may also be other charges so it’s definitely worthwhile considering using a planner who has knowledge on the destination you are considering. Factor in travel, food and accommodation for your planner and their team. Also account for flights and accommodation for non local vendors and check if there are any legal restrictions for them to work in the country you are marrying. There will also be tips, local travel expenses and unexpected costs too. You do not have to pay for wedding guests’ flights or accommodation but you should include every wedding guest in every celebration. Welcome parties, cocktail receptions, group excursions or a post wedding brunch will keep everyone included and in the party mood. People have come a long way to see you get married, so make sure at the very least the wedding reception is special. You may have decided the country that you want to get married in years ago, or you may have no clear plans. The 3 key things to consider when choosing the country you will get married in are; how much travel time are you and your guests happy to do? If the main flight is over 15 hours, you may be pushing it to then add a domestic flight or a boat ride. The 2nd thing to consider is who among your family and friends absolutely HAVE to be at your wedding and what would be the limit in travel time/remote location they can manage, especially the elderly. The 3rd element is the backdrop of your wedding ceremony. There is no point in booking a city wedding when all you really want is a vista of the ocean, mountains or a lake. A light shower is one thing, but be aware of big weather events that could mean a big ole storm! Even though there’s warm weather all year round in destinations like Thailand, December to April has the most days of sunshine. However, you don’t have to stick to the high seasons if the chance of rain won’t stop or ruin your day, and you will benefit from some great accommodation deals to keep your budget under control. Who knows, luck and the sun Gods could be on your side and bless you with a lovely, sunny day. We advise you to stay clear of big local and international holidays, where accommodation and flights will be more expensive and your chosen venue may not be possible. That said, if your wedding date has a special meaning for you, for instance, a New Year’s wedding; just know you will be paying more when booking your destination wedding. When booking your destination wedding, you’ll can opt for a wedding package or a wedding planner who can help tailor your day. Resort packages tend to be a more standardised, but there are plenty of luxury resorts who offer weddings and will deliver a stunning and memorable day for you. 2 draw backs of a package are that most in-house resort ‘wedding planners’ often hold another job meaning less time for you. Also the resort will usually only offer in house wedding services and vendors and do not usually hold your hand through the whole planning process. A wedding planner however, will make sure you haven’t forgotten anything, which will ensure your day matches your vision and to make the whole experience stress free. If you decide to hire a wedding planner, do your research and check online for feedback. They should have established relationships with local vendors. A wedding planner with lots of local knowledge (like myself :)) are especially helpful finding a quality wedding venue which meets your needs, that you could never guarantee by online searching. A venue may have excellent feedback for their wedding package, but how can you really be sure that the other couples’ ideal day is the same as yours? If you want a truly unique wedding, a locally based wedding planner is the way to go. 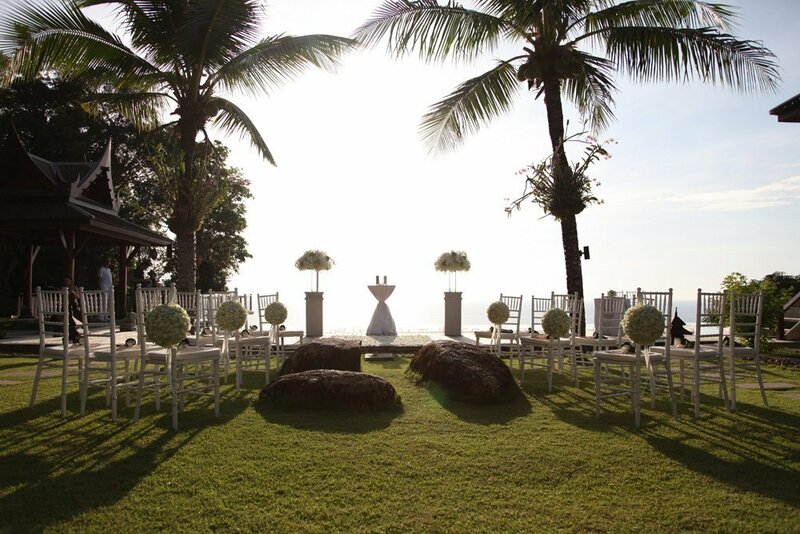 If you pick Siam Weddings, I like to take the time in our initial consultation to truly understand what you want/don’t want, as well as knowing the best times of the day, understanding the marriage registration laws, local customs and language. I offer suggestions and recommendations to make your day is memorable and designed the way you want it. I will also show you areas where can reduce your costs. The longer you allow for your planning, the better, then there is no rush to make decisions – typically I would recommend a year, but it can be done in less time. 6. Not using a wedding planner? Visit the location/venue or opt for a Venue Sourcing expert. If you’re not going to use a destination wedding planner, then you should consider organising a ‘Wedding Planning Trip’ to review your short list of venues and meet with all the vendors. Go to your wedding destination the same time of year that your wedding will take place, that way you can check out the weather, how busy it is, arrange a menu tasting with the caterer and a trial with your hair and make-up artist. It will make you more confident about booking your destination wedding. Not everyone has the luxury of time or the budget to do this themselves. If this applies to you, then ask local wedding planners if they offer a ‘venue search’ service. 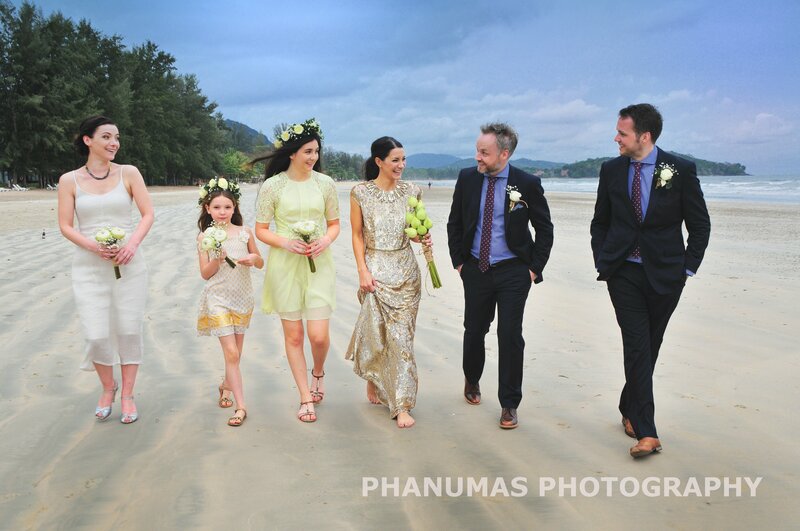 Siam Weddings offers this service to all of our clients. so there is no pressure to decide if they want the full planning services from the outset. ‘Venue Search’ is a perfect service for those on limited budgets, or those who want to manage on their own. 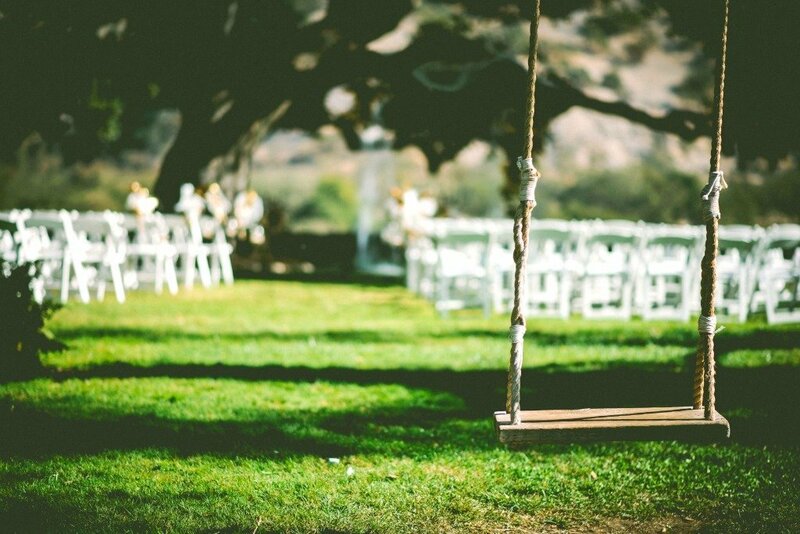 Looking for a wedding venue without specific dates means you’ll be more flexible when it comes to booking a venue you really love, rather than one that is not quite what you want but fits your timeline. Don’t forget about the backup wedding location. 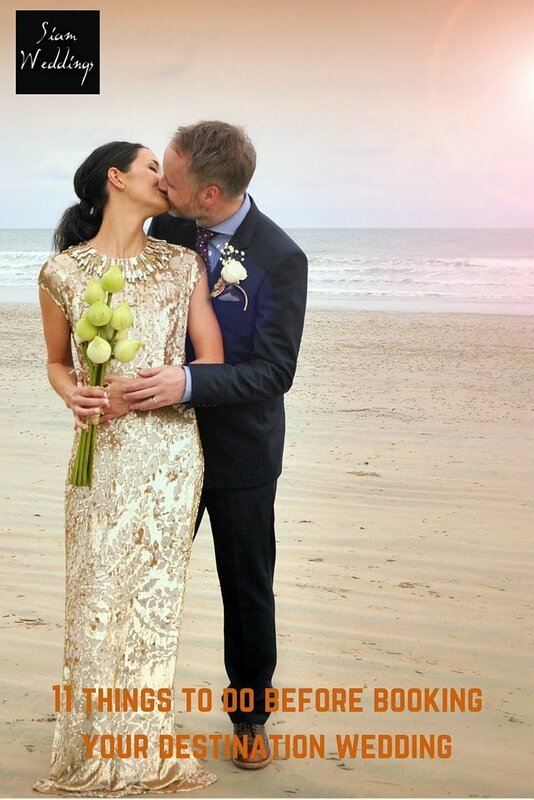 It’s easy to plan all the details of a beach wedding ceremony, and not check out the quality of the venue’s backup indoor option if it rains on the day. Also ask the hotel or resort about other events taking place that day. While most luxury resorts wouldn’t have several weddings going on at the same time, it’s always good to check this out for sure or that they haven’t had an influx of weddings and their staff are exhausted. Also ask about any business seminars that may be booked at the same time. You ideally want to be the only event at that venue. Don’t forget that you can also have your wedding in private locations such as a villa, a vineyard or have exclusive hire of a stunning restaurant with a view. If you have a wedding planner, they will read and negotiate the contracts for you, but you should read the contracts too. A typical wedding venue contract can be long and may take weeks to negotiate. If you haven’t opted for a wedding package, you should ensure all your wedding requirements, both large and small and what their charges do and do not cover are covered in the contract and make sure your planner has a contract or agreement that you can both sign. Many destination weddings are not legally binding. This shouldn’t be a problem as you would be able to register your marriage in your own country. That said, many of our clients want to sign their marriage certificates the same day as they say ‘I Do’. Ask your wedding planner if they can assist you with the process as it’s important to make sure you do it correctly. At the end of the day, it pays to use a professional to assist you, not only make sure that everything is legally binding in your home country but also to make sure you stress levels are kept to a minimum. If a legal wedding ceremony is too complex, opt for a symbolic ceremony and make it official back in your home country, or speak to us as we can help you navigate all of this very simply here at Siam Weddings. You’re going to start planning and booking your destination wedding far in advance, so take a little look at the expiration date of your passport. Make sure you and your partner’s passports are valid at least 6 months after you fly home. It’s worth reminding your guests to also check that their passports are not due to expire. Okay, you are good to go! Now you can book the wedding venue, sign contracts and send out your ‘Save the Date’ notices. Send out the notices as soon as you’ve signed the contract with your wedding venue. Anywhere up to 18 months or even 2 years in advance is fine. For a destination wedding, ‘Save-the-Date’ simply means notifying future guest of the overall the wedding dates, which usually run over 3-5 days, and telling them exactly where the wedding will be held. All the other details can come later. It’s helpful to give your wedding guests lots of notice so they can book time off work, start saving for the event, or look at combining your wedding into a longer holiday. So there are are our 11 top things to do before booking your destination wedding. Stay tuned for more top tips on our blog. Salutations and smiles from Thailand!